If you follow our blog at all regularly, you will realise that we haven’t made it home yet in our blog, and there has been a long lull in our writing. We indeed are settled, or I should say settling back into our home. We’ve been too busy unpacking, planting the vegetable garden and visiting with family and friends to write. But we are looking forward to writing about our final few weeks in Europe/Iceland. Cam. Wind power. Love it, or hate it. Controversy abounding about this energy source seems to have polarised people’s views. Here in Ontario, most of us talk about wind power in the abstract sense – few of us live within sight of wind farms. 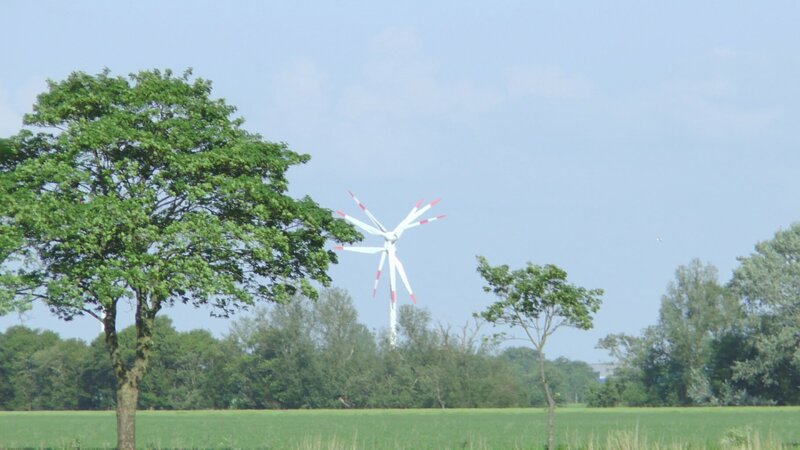 But there were very few places during our cycle through northern Germany where you couldn’t see a wind turbine. 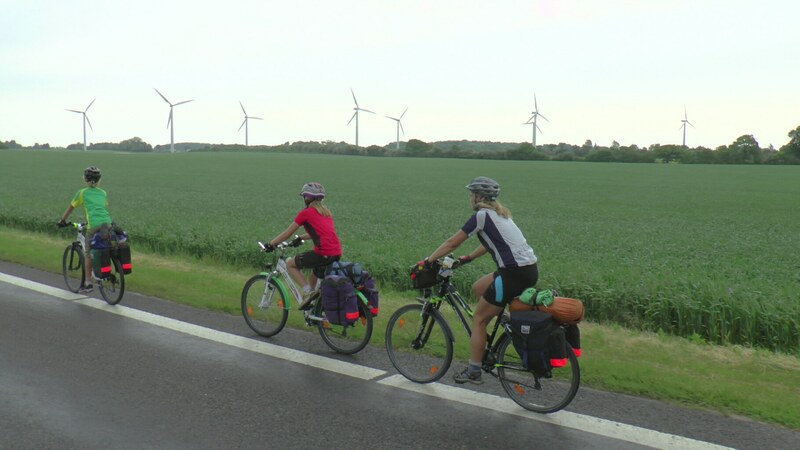 In fact, for much of our cycling in this region, we could see vast wind farms – with so many turbines that I had to stop my bike to be able to count. I got up past 40 once before I gave up. And I, for one, like to count wind turbines (just ask my kids). Germany in general and northern Germany in particular (that’s where the wind blows best) has seen a HUGE growth in wind power over the past 15 years. It is in part due to the dominant political climate in this part of the world that looks towards renewable energy for energy self sufficiency, and that actually cares enough about climate change to do something substantial and ambitious to reduce emissions. But the German story is something much more than this and it deserves a bit of attention. 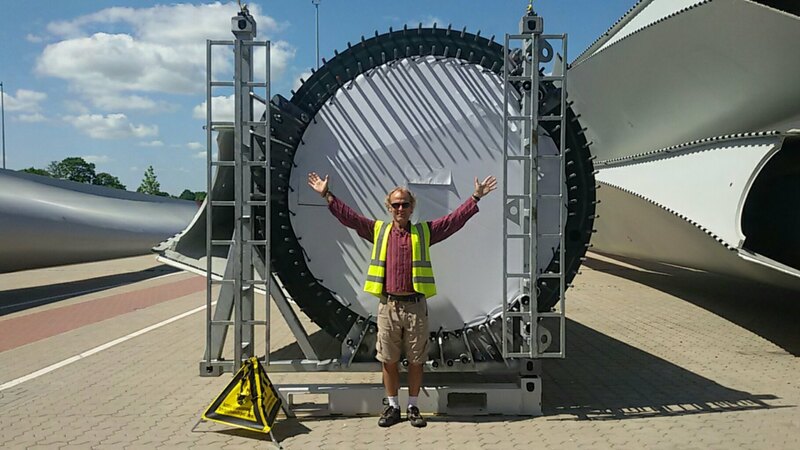 I had intended to write a fairly substantial piece on the German renewable energy story, but in light of the fact that my last entry (green Freiburg) was rather long and thick in content, I will stay short here in hopes that one or two readers will still peruse my entries :). Germans have always been uneasy about nuclear energy, though they leaned heavily on it in the late 1900s. They also relied heavily on coal – some domestic and much imported. Oil and natural gas were imported. Hydro is all but non existent. And of course, Germany’s well known manufacturing base is hungry for electricity. A visionary in the late 1990s by the name of Herman Shear (passed away just a couple years ago) started agitating for a renewable future for Germany and by the early 2000s (he was then an MP) his plan was really taking hold. The cornerstone of his “Energiewende” (energy turnaround) plan is the Feed In Tariff (FIT). Under the FIT, independent renewable power producers were guaranteed access to Germany’s electricity grid, and were given 20 year fixed price production contracts. Their price per kWhr of generation depended on the technology. Roof-top solar PV got the most, ground-mounted solar next, industrial scale solar next, wind and biomass next most. The prices were set to provide significant incentives for producers to invest, and recognised the different build costs of the technologies. The prices also reflected the reality that solar produces when it is needed the most (mid day) and the idea that roof tops were otherwise useless areas (whereas fields and yards can and should be used for other things). In all cases, purchase prices were more than what the Germany utilities were selling for – so it was subsidised as green energy, and as a significant job creator. Importantly, the purchase prices dropped over the year to reflect dropping production and installation costs. Germany had very ambitious targets for wind and solar PV. And in every case, they blew their targets out of the water. They would reach the 5 year goal in the 1st year, for example. They would surpass the entire EU target all by themselves. Superlatives abound. Money poured into solar and wind manufacturing, and new green collar job creation boomed. Germany had, in only a half decade, established itself as the world leader in renewable energy policy, technology and manufacturing. They are now surpassed only by the USA and China in terms of new production coming on, but these two economies are of course much larger than Germany’s. And almost all of this growth owes to the FIT. Dalton McGuinty’s liberal government in Ontario took note of Germany’s success and in 2008 created a Green Energy Act that was modelled very closely on the German approach. We too call our incentive the FIT. In fact, Ontario Environment and Energy officials toured Germany and met with Herman Shear in their research. So if any Ontario readers wonder where all the roof top solar PV and the steady growth in wind power comes from …. thank (or scold, if that’s where your politics are) Herman Shear and his progressive colleagues. Yvonne and I installed 15kW of solar PV on our two roofs 5 years ago. We produce much more than we use on an average day. On a sunny summer day, the two roofs produce 90kWhrs, while our (one) house uses 5kWhrs. Our investment will pay itself off in a year or two from now. The rooftop solar PV (micro)FIT started at 82 cents/kWhr (we got in then). I believe it is now down in the 35 cent range. This drop recognises the substantial drop in equipment cost and installation efficiency – which is another sign of success. Anyone who reads the word “subsidised energy” might rightly worry about rising electricity costs. Germans were worried. In the end though, the cost of electricity in Germany related to the FIT program rose by only about $50/yr for an average household. This was the cost of vast improvement in energy security, weaning off nuclear power, and tens of thousands of new high paying jobs. It is worth noting that after the Fukushima nuclear disaster in Japan, Germany decided to close out all nuclear power – even if the plant had service life left. This has ironically resulted in a return to domestic coal power (and increase in CO2) while the country awaits further roll out of solar, wind and biomass power. We met many Germans during our travels this year. I would ask them what they made of their renewable energy leadership. Surprisingly (to me, anyway), most did not know they were leaders. 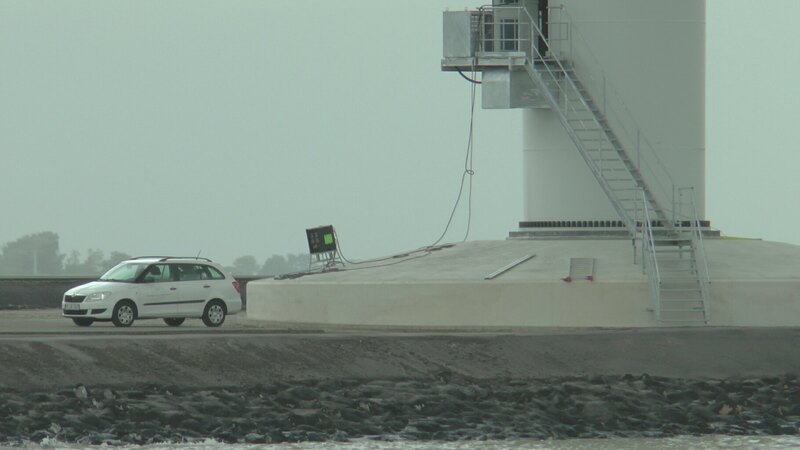 And also surprisingly, most that did know just laughed, and told the story of the huge offshore wind farm in the north sea that ran out of money before the electrical cable that connected the turbines to the shore (grid) could be installed. They were hugely cynical. I asked some Germans in Germany about this and they acknowledged that they are cynics by nature and are their own worst critics. There is some push back against the FIT in Germany for sure, but the basic approach steams ahead. OK, I’m done on the FIT. And YES, this is my short story! 🙂 Those with an interest in the German story should read Chris Turner’s “The Leap”. Jake’s Holland blog leaves us hunkering down during a huge wind and rain storm in a fabulous little greenhouse that we found in a little campground on the east coast of Holland. We made our way to the town’s harbour to take the ferry across the Eems inlet the next morning and discovered a large group of people waiting to board some zodiacs. Their leader was wearing a t-shirt with “Hansa Green Tour” written on the back. This of course caught my interest! 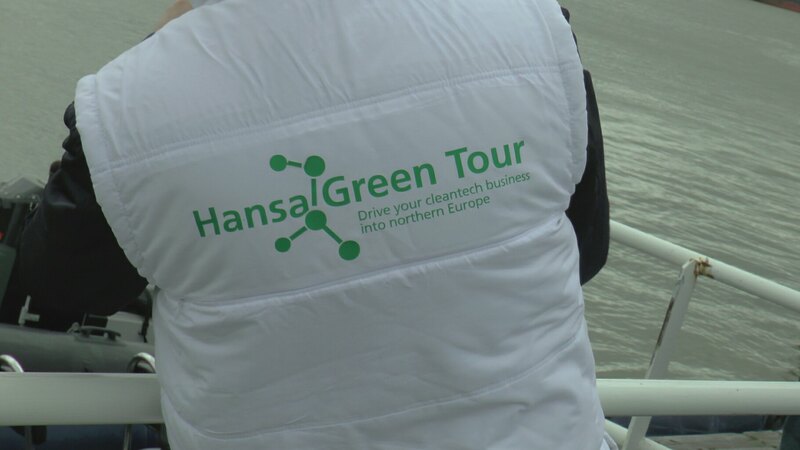 I learned that these energy professionals were touring solar, wind and biogas sites across Germany and Denmark and were meeting with local officials to study policy approaches. 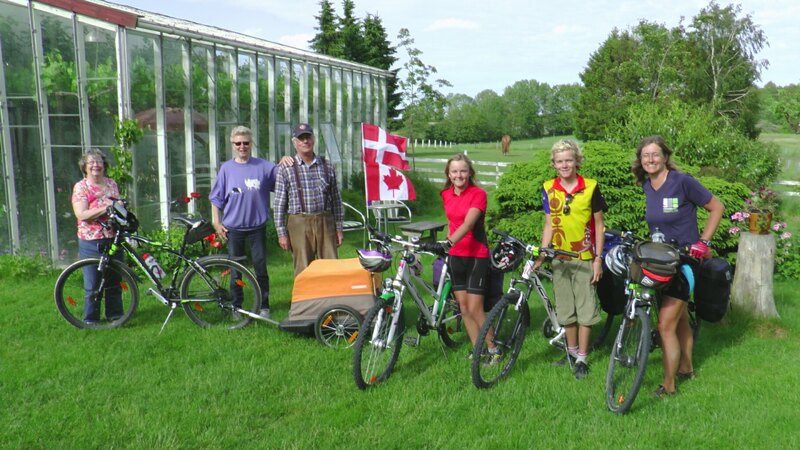 I then found the trip description on their website and laughed when I noted that the tour gave a prize to the participant with the lowest transportation carbon footprint. Charging stations for electrical vehicles had been mapped out across the route, and a tow truck was following the tour in the event that a participant ran out of charge. A significant portion of the participants were apparently driving Teslas, and the rest “just” regular lower end electrical vehicles! Welcome to northern Europe!! 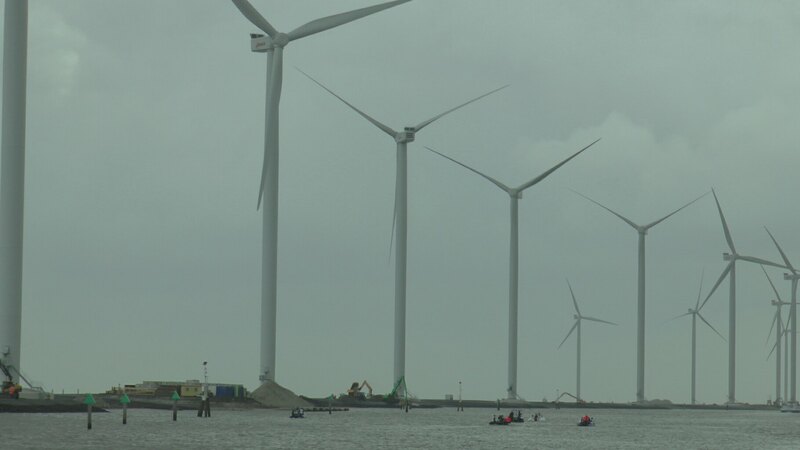 The tour was in town (Delfzijl) to see Holland’s latest huge wind farm that was built on the shore of the inlet. 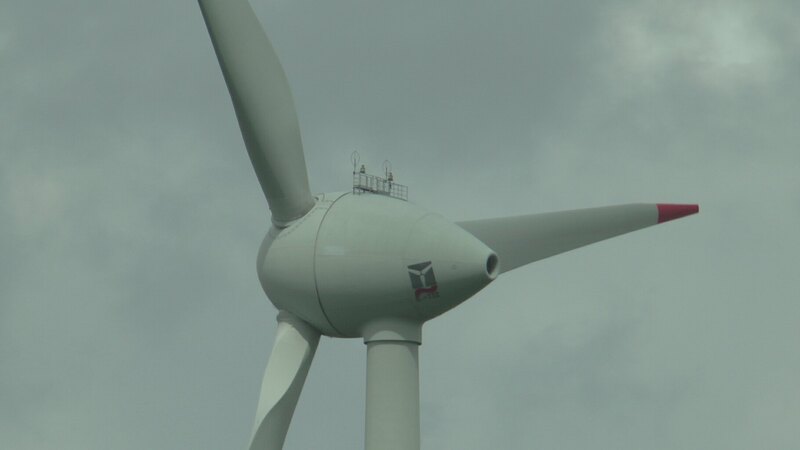 Most of the new turbines had yet to begin production. This one appears to be in final testing stages. 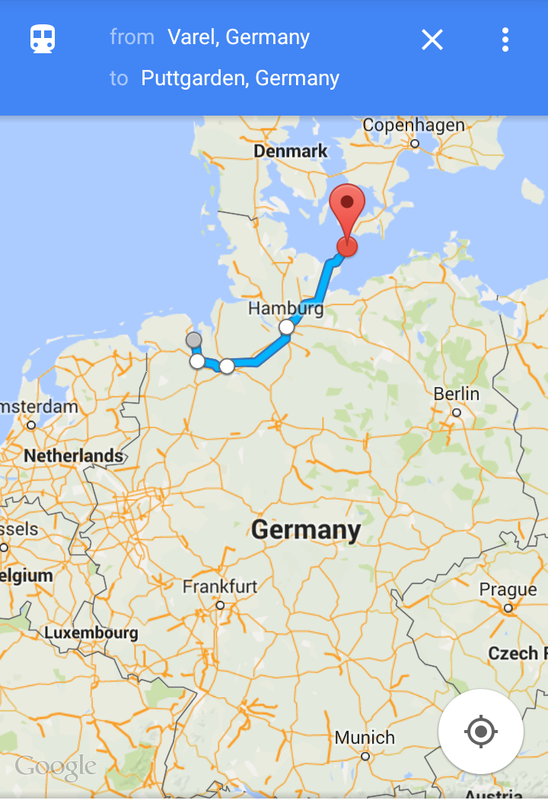 The journey across the Eems inlet that separates northern Friesland (Holland) from Northwest Germany took only about 30 minutes. Yes, we've arrived in Northern Germany! 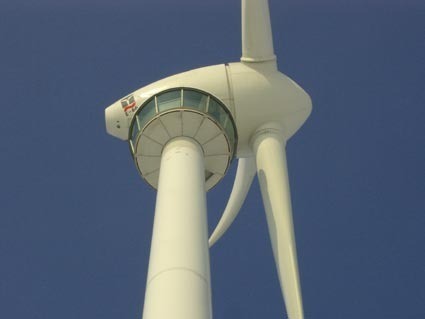 We noted that the large German wind manufacturer Enercon's nacelles (the part on top of the post that holds the hub and blades) was a much different (cone) shape than the rectangular nacelles of the Danish giant Vestas. I bet your world stood still when you learned that. 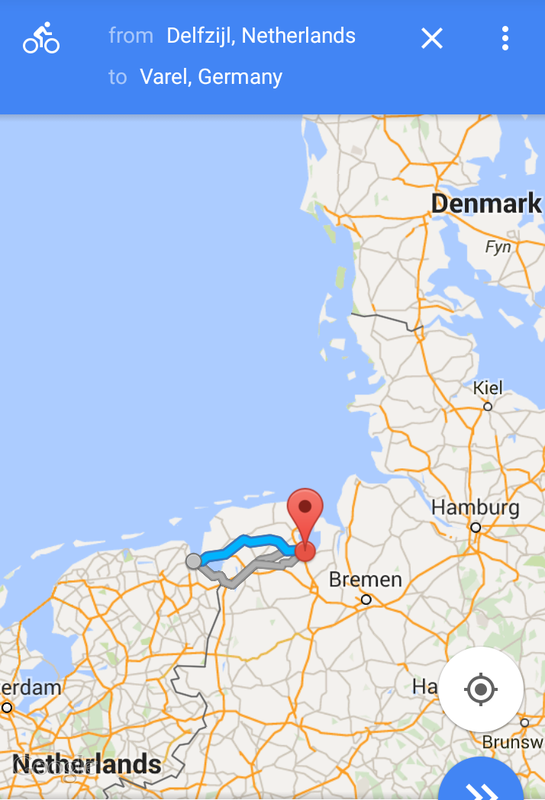 Volkswagen has situated one of their large manufacturing facilities at Emden where we landed. Germany has to make the most of its few sea ports. 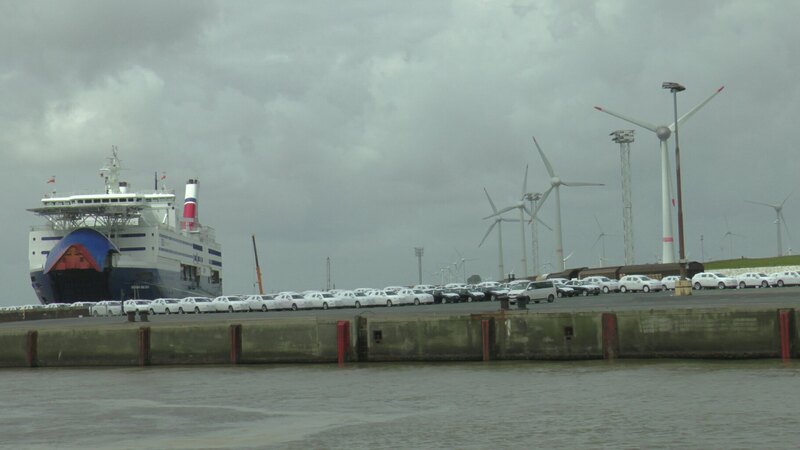 These shrink wrapped VWs were about to be driven on to the car carrier here. 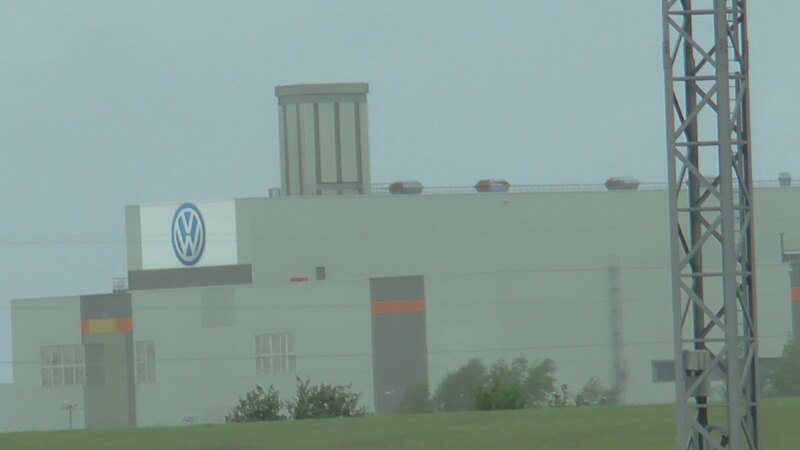 I'm guessing that the wind turbines were owned by VW. 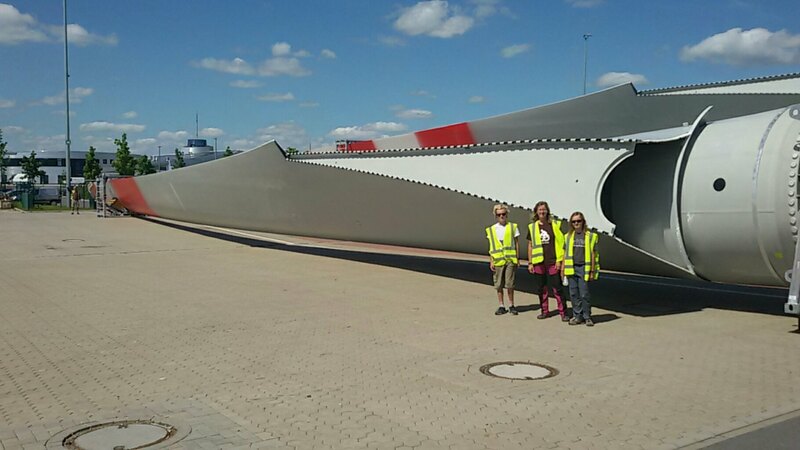 We had only ridden about 1km from our ferry dock when we came across all these wind turbine ("spare"?) parts lying around the port. 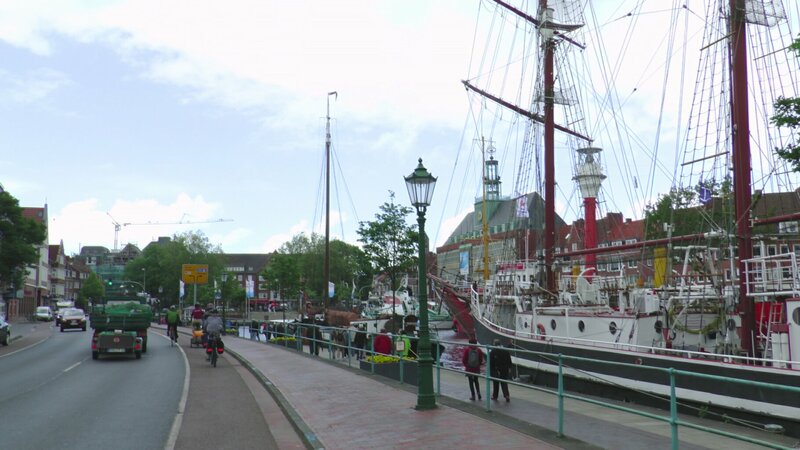 Cycling past the town's tall ship in Emden. Emden turned out to be a fabulous little city. The inner port was dotted with maritime museums, the tall ship above, and a great little fast food fish stand where we gorged on lunch. A large international film festival was starting the next day, and walking streets and cafés abounded. 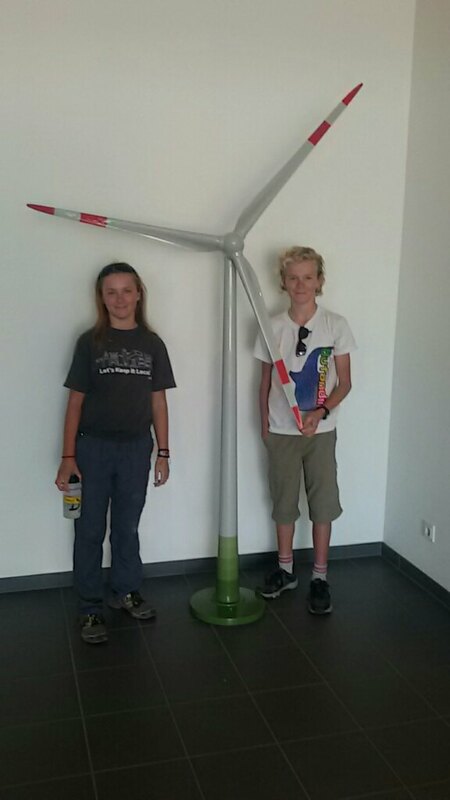 We spent most of the afternoon trying to line up tours of a wind turbine manufacturing plant and an actual wind turbine. On the latter, you can climb 60 or so metres up a wind tower to an observation deck located just below the nacelle. They were however not offering the tour during our time frame. I know this because I used google translate to translate back and forth emails about 3 times with their German-only speaking contact 🙂 I was very persistent with our contact at Enercon’s HUGE production facility in Aurich and managed to get us a tour at 9AM the next morning. Aurich was about 40km away though so we needed to set off in the late afternoon from Emden. 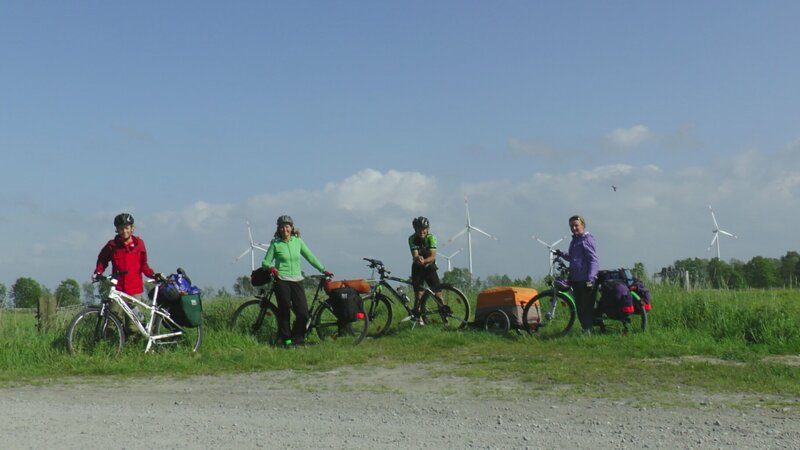 Enjoying the late afternoon sun as we cycled into the wind turbine landscape of Northwest Germany. This part of Germany is also referred to as Friesland, and shares its love of transportation canals with Holland across the inlet. 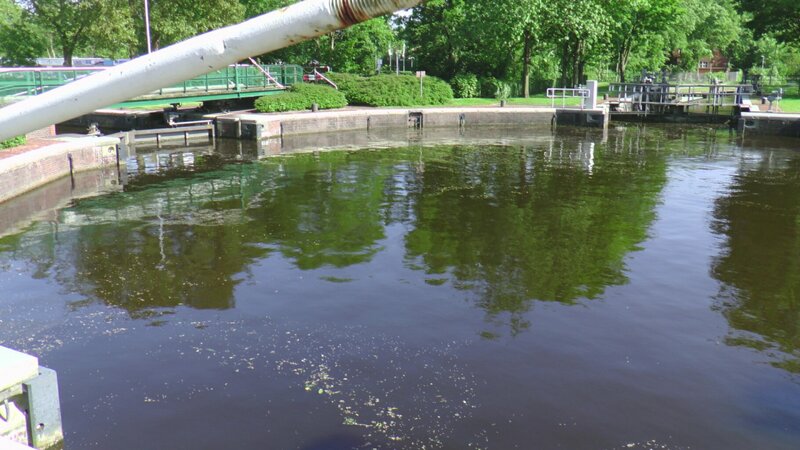 This particular one was a canal "roundabout" - 4 canals joined the central roundabout through individual locks. Can't recall ever seeing one of these before! no, not 9 blades on one turbine ... I just like when 3 turbines line up! perhaps not recommended in the bicycle safety guide, but it worked for me, and Yvonne got comfortable with this approach too. We found the PERFECT place to make dinner. Soft afternoon sun, beautiful boat to gaze at, and a picnic table to boot. Actually, Yvonne did almost all our meals (I don't like cooking on her camp stove). Note the beer ... we were back in cheap Germany again. And note Kaia - she was (and still is) hands down the most conscientious blogger of the four of us. Jake is now part of the dinner prep team. It's the little details that matter in the transportation game. 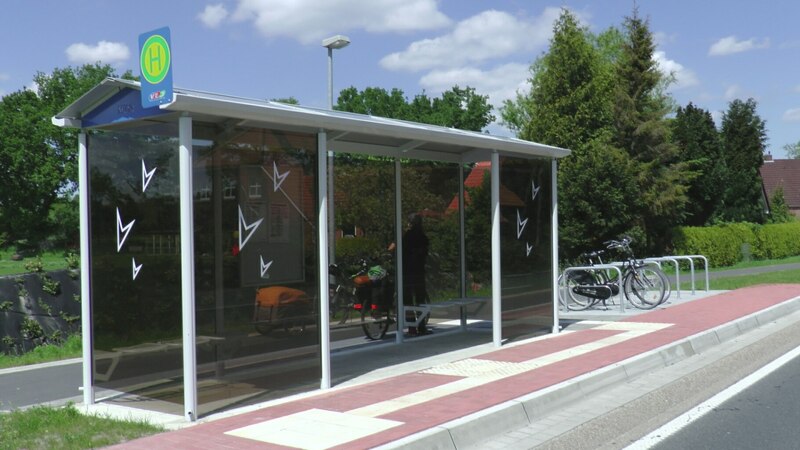 We saw good bike locking facilities at even the smallest, remote bus stops. When we arrived in Aurich we got a little sneak preview of our next day's tour. Holy jumping big blades, Batman! I used the satellite photo feature on google maps to locate a forest right near the Enercon production facility in Aurich. We weren’t too sure how discreet the forest site would be for camping so planned our arrival to have just enough light to set up the tent before jumping in (yes, that’s about 11PM!). 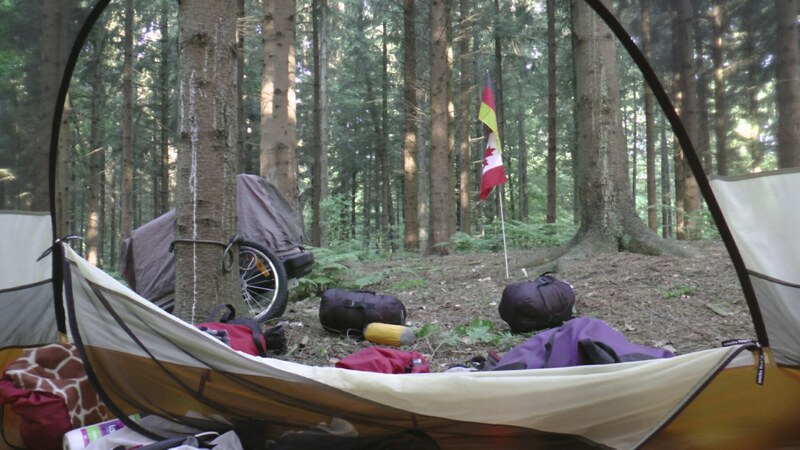 We awoke in the morning to this lovely sight - probably one of the nicest campsites we found in Germany. Note that the German flag had been reinstalled on our bike trailer safety pole. We camped only 1.5 km from the Enercon factory so thought that the 15 minutes we’d left to get there would be ample. But it turns out that the “factory” is actually a huge campus of factories and support buildings, all with significant security, so it took quite a while to navigate to our tour desk. The four us met with 2 other Enercon employees visiting from their Spanish operation and our very energetic and extremely knowledgeable guide, Timo. Unfortunately, cameras are not permitted inside the buildings for competitive/security reasons. 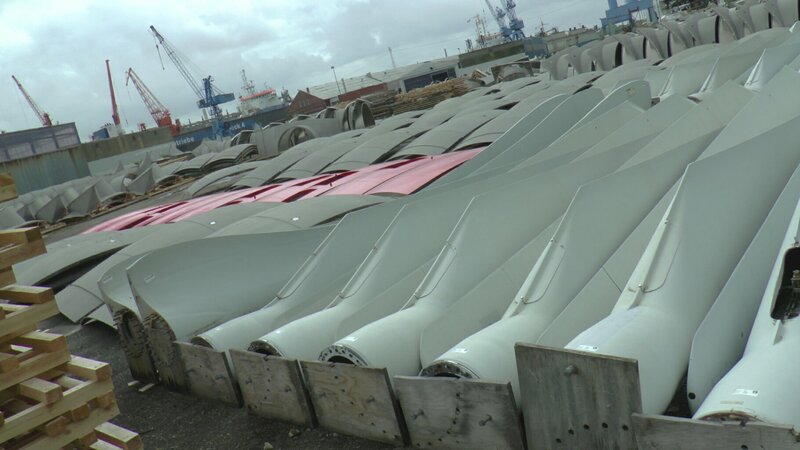 I say unfortunately, because the visuals of the production of 55m turbine blades in different stages of manufacture are really quite breathtaking. 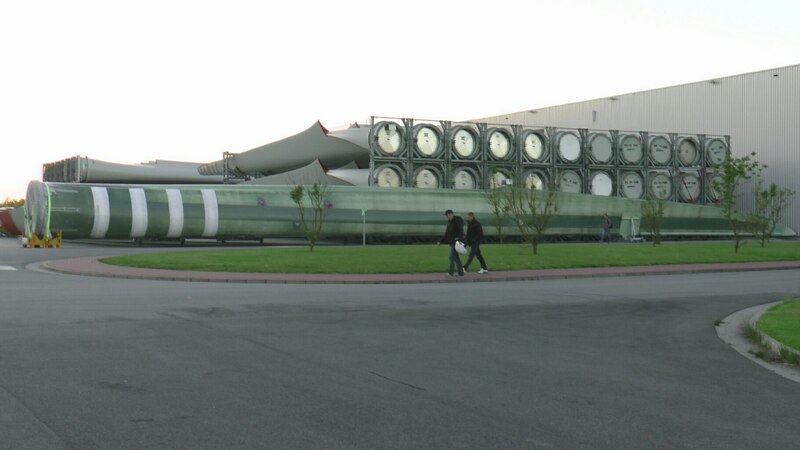 This facility produces blades for their 3MW Enercon 121 turbine model, which means that the rotor diameter is 121m. The hub sits atop towers that are anywhere from 100 to 150m high! Enercon makes blades for their other turbine sizes in 9 other factories around the world (though 6 of them are in Germany). 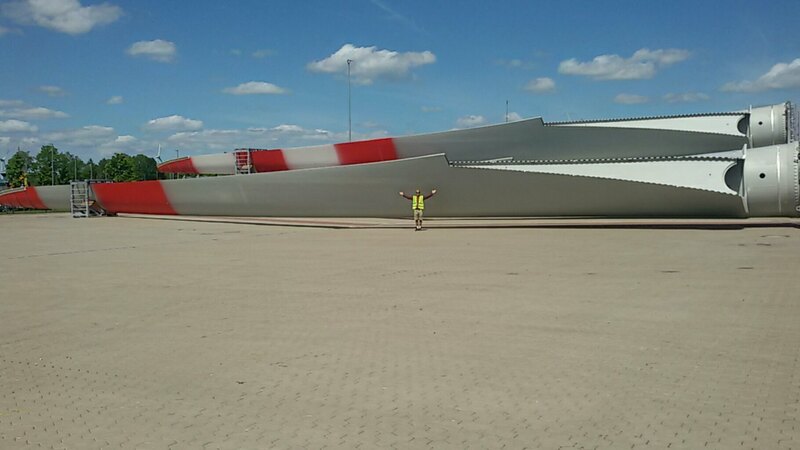 Their largest, with blades 70m long sitting on 135m towers crank out an amazing 7.5MW. 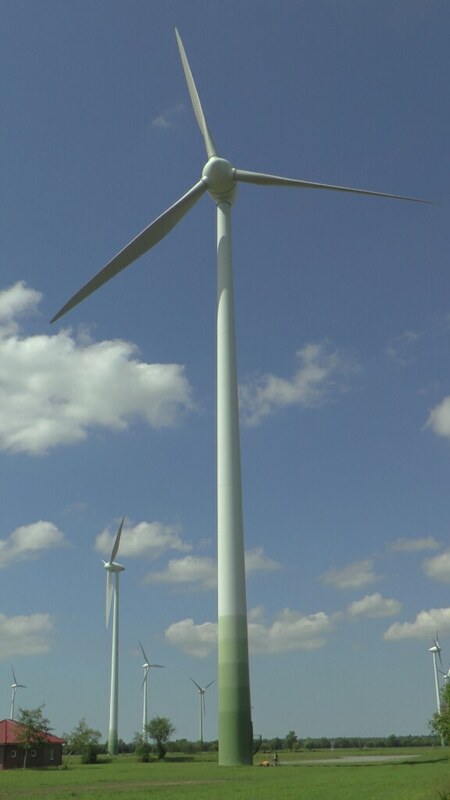 One of Enercon’s competitive advantages is that their blades can be “feathered” in high winds (change the pitch) so that they don’t need to be shut down like some competitors’ do (they DO need to be shut down above 30m/s which is storm like). The generators that sit in the hubs were produced in the next factory over, and the towers and hubs in other facilities in northern Germany. Enercon bought the local train company outright so they could customise it to get their blades to the port 45km away. This business is not for the faint of heart! The factory is massive, of course, and was a hive of activity. Blade manufacture is still done almost entirely by humans. In this case, 3 shifts of 300 workers work around the clock, producing 1 blade per shift. So that is blades for 1 turbine each and every day. There were about 35 stations that the blades moved through … and at 55m long you can imagine that the task of moving the blades from station to station is not insignificant! Blades are a combination of fibreglass, resin, and lightweight plywood. And when spinning at such high velocities, there is no room for error. Our guide was full of great anecdotes, and quite enjoyed describing his ultimate boss, the Enercon owner/founder, Aloys Wobben. This fellow is now relinquishing control due to his age, but he is apparently both very laid back on the shop floor (wanders around, just watching and smiling, blending in) and very demanding of his team. In earlier years he would be working on design issues at home on a Sunday, and when he thought he had a break-through he’d call up his senior team to come over to the house to provide feedback on the new idea. Telling him that you’re in the middle of Sunday dinner with your family was not an option! Eventually the tour moved outside and I was able to pull out my camera. Different countries have different requirements for the painting of the blades. Germany was 2 red stripes on the tips. I was impressed by many things on the tour. But mostly I came to realise how complicated, high tech and large scale (physically) the wind turbine industry is. 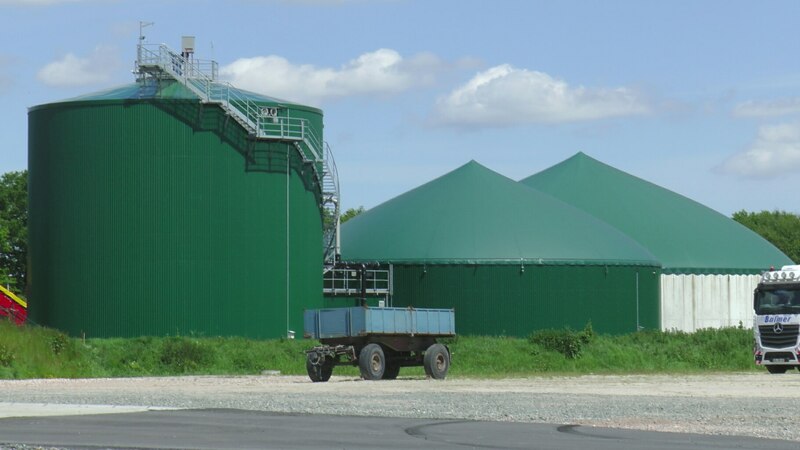 Enercon had just finished construction on this biogas generation facility that fed electricity into its manufacturing plants. The flexible roofs allow gas to collect in the digesters below, and provides a low pressure feed of methane into the electrical generators. Feedstock includes mostly manure and agricultural waste. From Aurich we continued east across northern Germany … right into an Enercon wind farm! Look for me at the bottom of the tower. 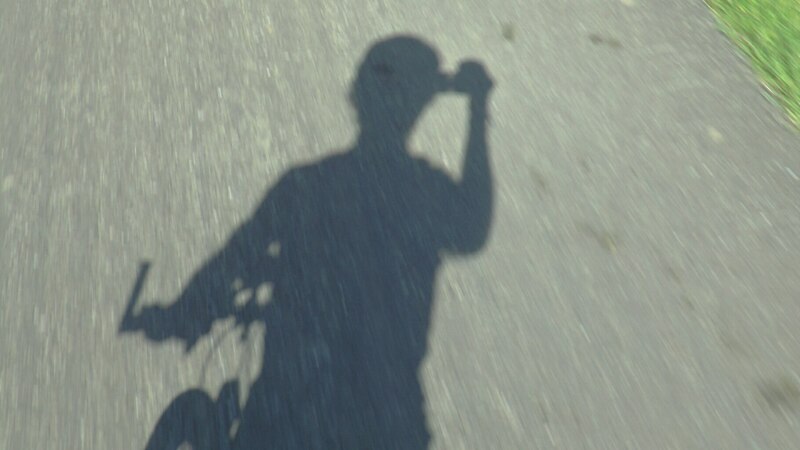 Google maps was actually quite impressive in its ability to find cycling paths. But in a few rare cases like this, the paths got a bit "rustic". 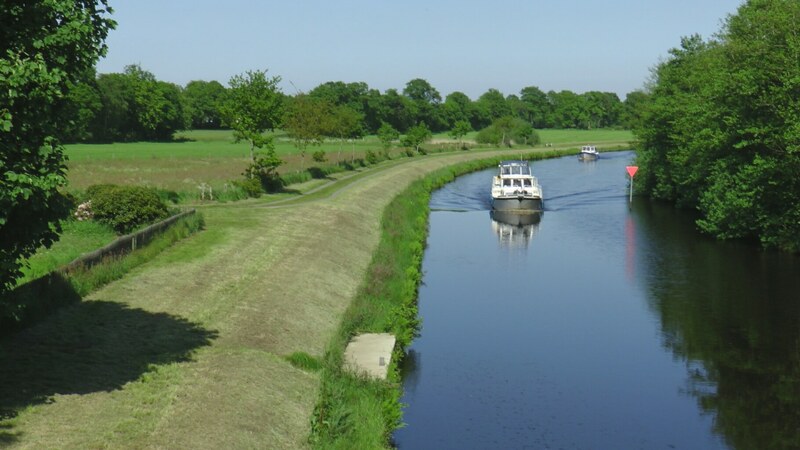 We were still in the "Frieseland" part of Germany where navigable canals are pervasive. 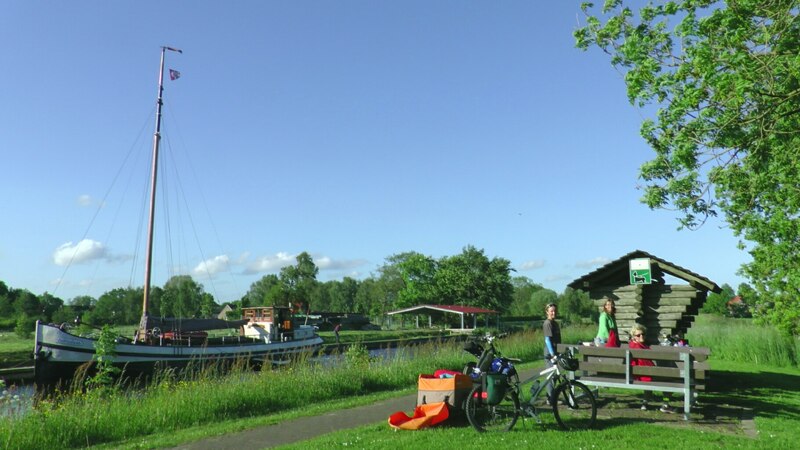 A full afternoon of canal-side pedalling brought us to near Varel where we camped. At this point we actually had a “deadline” to arrive at Yvonne’s Aunt and Uncle’s farm in Denmark where they and Yvonne’s mom would be waiting for us. Sadly, we were out of time for riding in Germany so planned to catch the train across the rest of northern Germany, then north from Lubeck to the tip of the penninsula at Puttgarden where we’d catch a ferry north to Denmark. 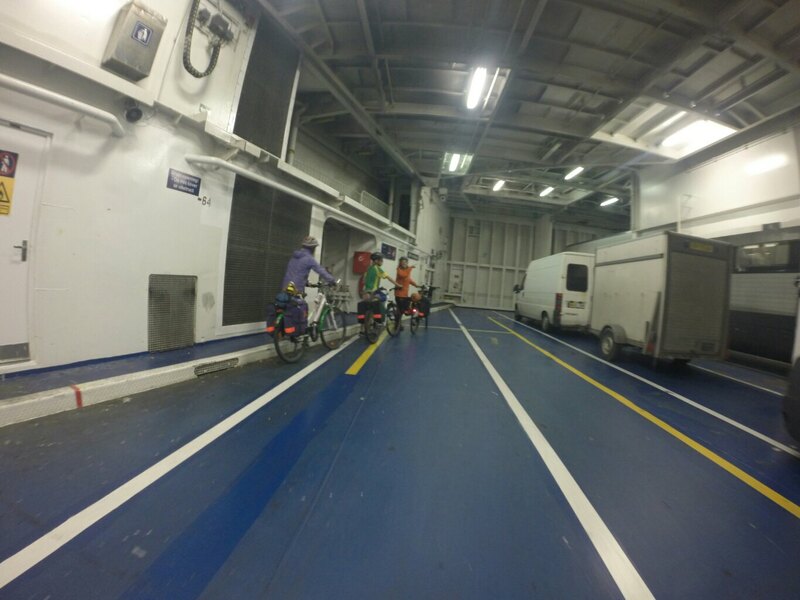 We arrived in the port of Puttgarden at 9PM and quickly cycled to the ferry terminal to see if we could catch the 9:20 ferry to Denmark. Just in time. For some reason, I really enjoy riding onto car ferries. The 1hr journey put us into Rødbyhavn Denmark a little later than we’d wanted to be looking for camping (10:30PM), but we were excited to get to Denmark. Yvonne’s late father Flemming was Danish and her mother Betty is an honourable Dane – she speaks Danish, cooks Danish, thinks Danish, and has visited Denmark probably 40 times. Yvonne travelled to Denmark almost every summer as a child, and the kids and I have been 4 times, thanks to Yvonne’s Dad’s desire for his family to stay connected to this fantastic part of the world. Making this all possible over the years was Flemming’s sister Marianne’s wonderful farm 1hr north of Copenhagen where we would stay. More on that in a later blog entry. 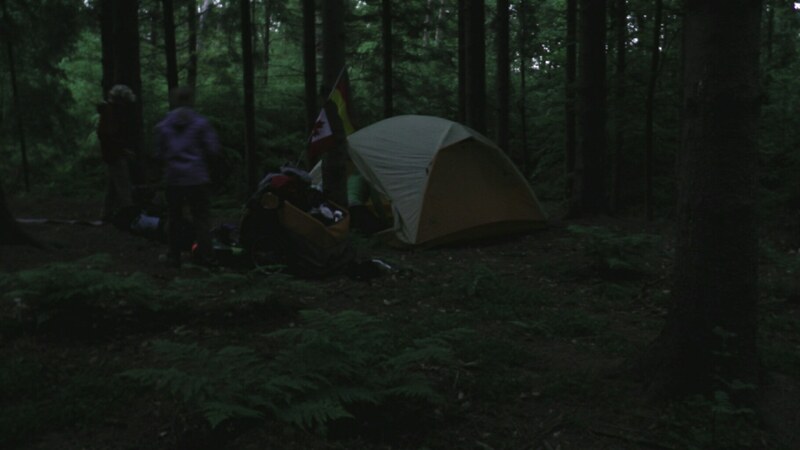 We weren’t really too sure what we could find campsite-wise in the falling darkness, but after 5km of rather random cycling we stumbled into the absolutely perfect freedom campsite – in a little park surrounded by thick forest, with a picnic table to boot! Next morning. Not bad, considering we found it in almost dark! We "lowered" the German flag on our safety pole and raised the Danish flag. We all agreed that the Danish flag looks pretty good beside the Canadian flag. 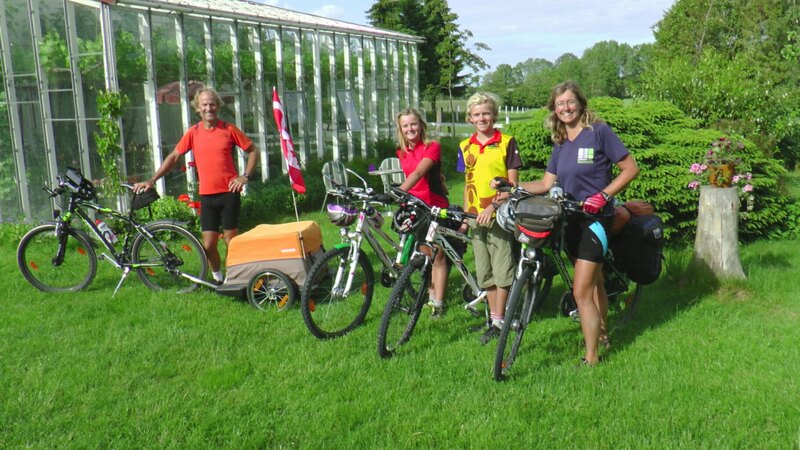 We had about 210km to cycle to the farm, and decided to try to do it in 2 days. We’d been talking about putting in a really full day to try to beat our best day from Holland, and this seemed to be the day. As soon as we hit the road we knew we’d chosen the right day to ride … we had the wind at our back, and were riding between 25 and 30 km/hr for long stretches of lovely bike path. 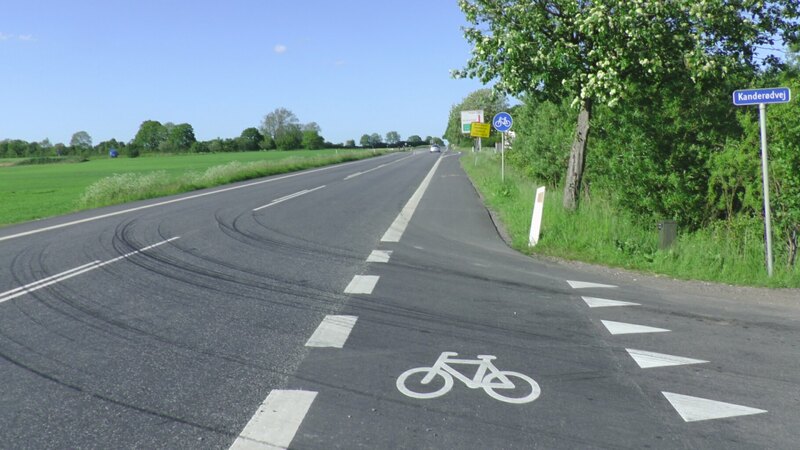 Yes, Denmark too has fantastic cycling infrastructure, and Yvonne and I had cycled through Denmark when she was pregnant with Kaia and knew we’d be treated to highway-side paths all the way. A rare stretch without path. But in Denmark wind turbines are ubiquitous. Denmark boasts the highest percent of wind power in a national grid - now up to 25%! They started 25 years ago through something like Germany's later Feed In Tariff. 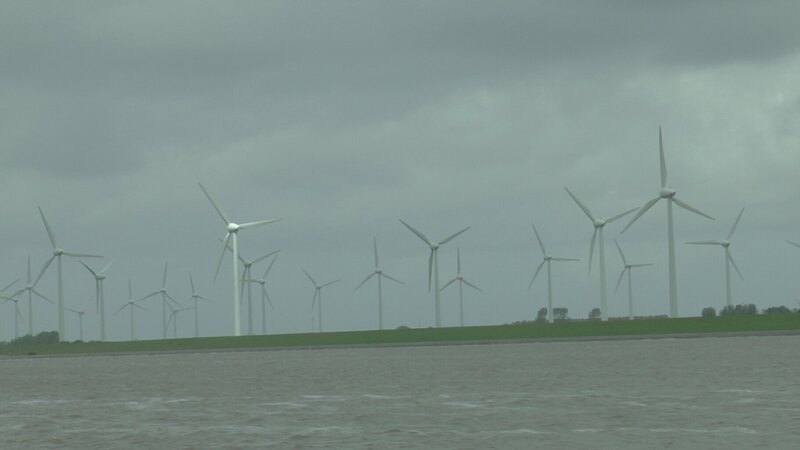 That said, wind power is still somewhat controversial in Denmark (they treasure their aesthetic agrarian heritage) and the country has fairly recently decided to focus almost all their new wind developments off shore. 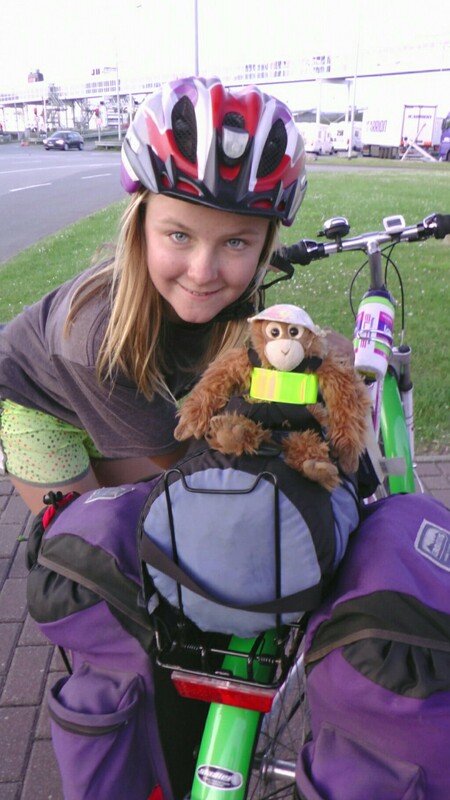 With cycling speeds up to 30 km/hr, Kaia thought it was important to beef up little Galdis's safety protocol. He is strapped in now with a helmet and has a reflective chest harness. We weren't the only ones logging lots of km this day. We saw two big groups go by - all with similar jerseys. 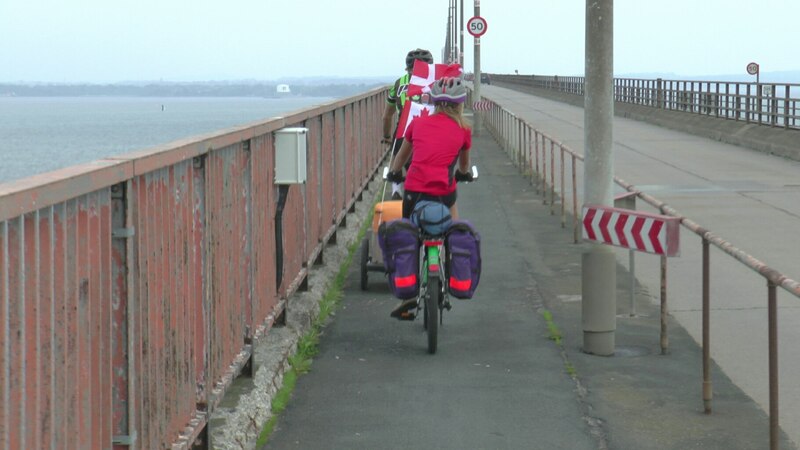 I'm glad this 3km long bridge had a dedicated cycle lane! Yvonne had popped a spoke the day before and it became apparent that we had to have it fixed, but didn’t want to lose too much time on our record distance attempt day. A very obliging guy in a bike shop in Vordingsborg fixed it for free while we dined on sandwiches at the edge of the supermarket parking lot, then away we went. 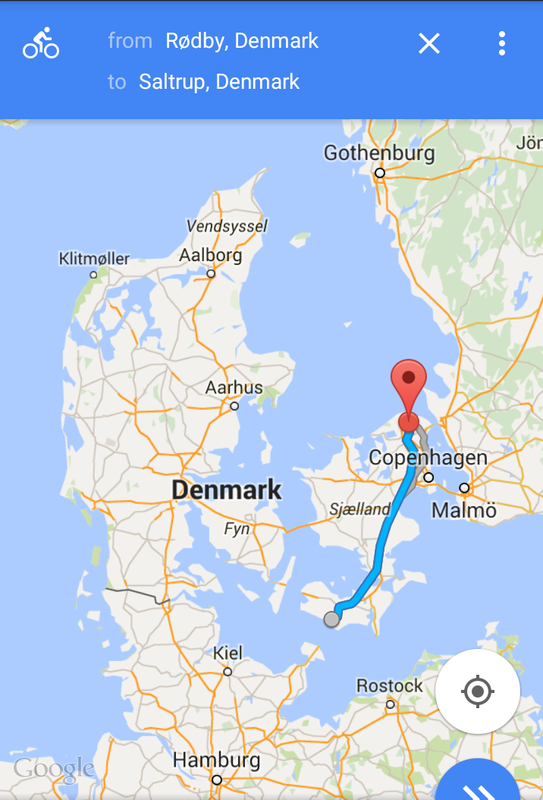 Our route north to Køge passed along the east coast for a while. 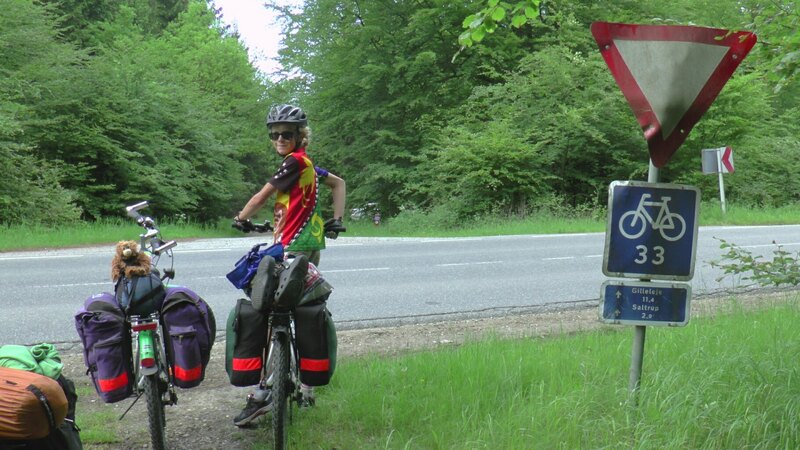 We’d done 60 km by lunch, and were feeling pretty good until we hit a really hilly and side-windy section of about 20 km. Record-setting was in doubt until things levelled out again and we got the speed back up. 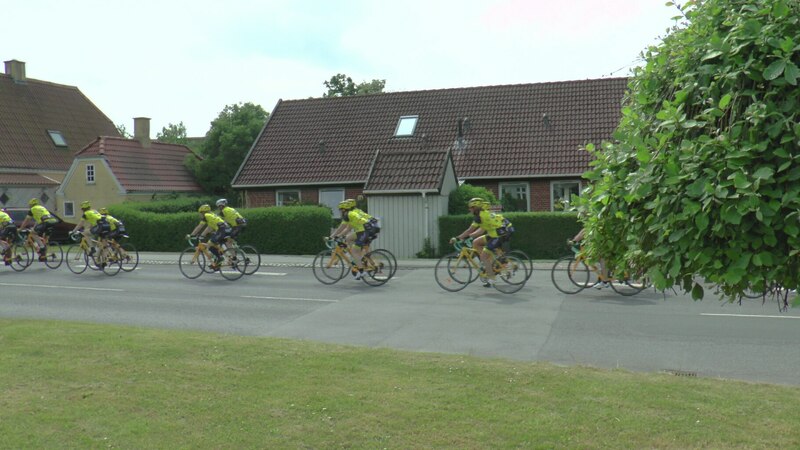 We watched our previous best of 104 km roll by with a whoop, then 110, and cruised into Køge on the coast at 120. 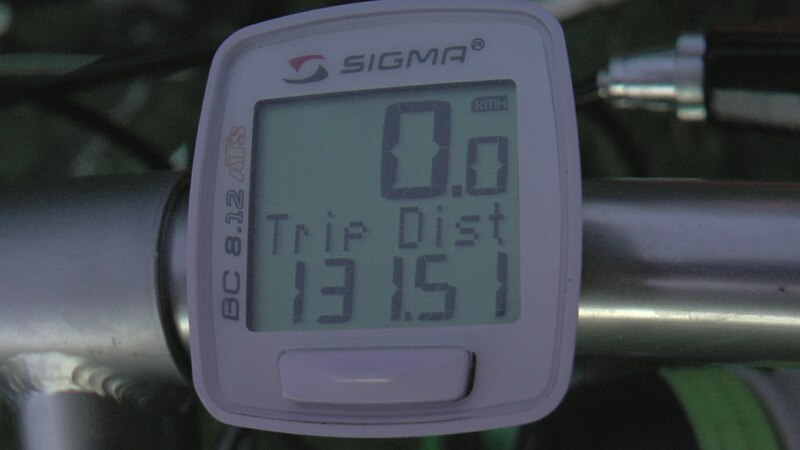 But by the time we’d cycled around the port, found dinner, and another freedom campsite, the odometer looked like below. I was proud of my family. Before our trip, the kids had never done more than 38km. And now this with loads. They were really tired but not complaining. 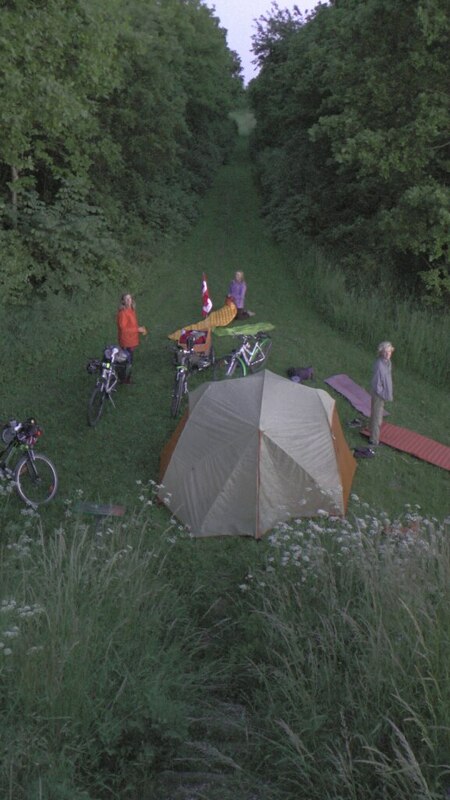 We’d actually decided to take a campsite that night to charge our google map-enabled phone, but they wanted about $40 for a little piece of grass. We all agreed that we could probably get enough charge into the phone during a bakery stop the next morning :), so we headed to another urban forest. You'd never know that we were in a pretty decent sized town. 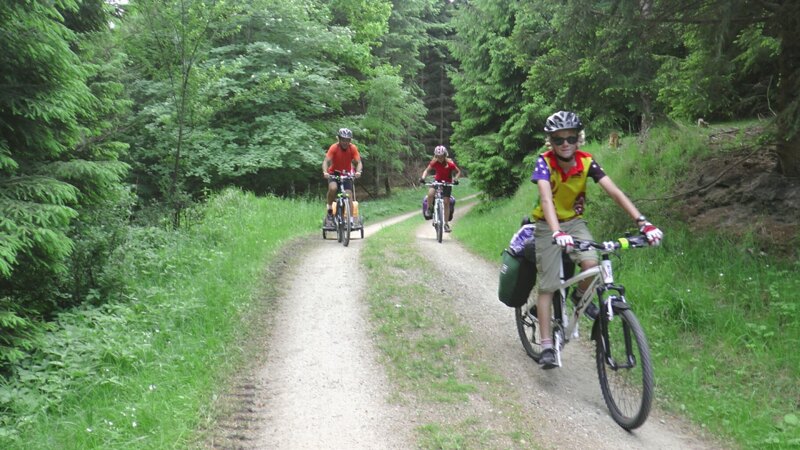 We rolled the bikes through some forest paths for a couple of hundred metres and here we were. We got an early start the next day because we still had a long way to go and wanted to arrive in time for dinner at the farm. 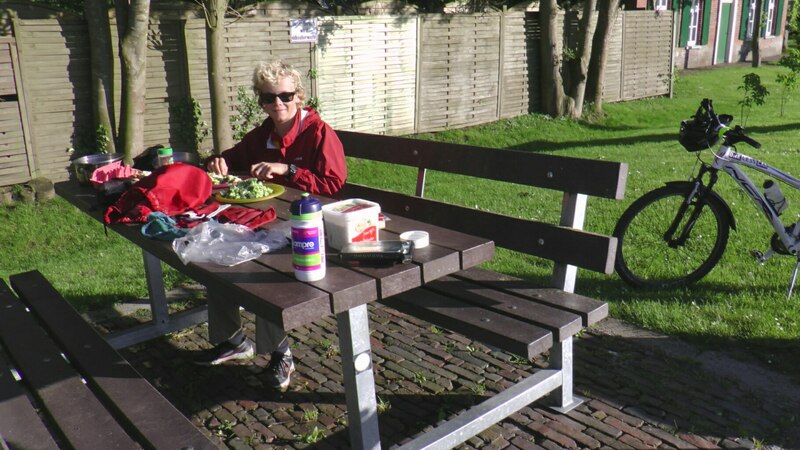 It was a fairly non-descript sort of day/ride, though I very clearly remember our lunch – that we made on a table just outside a fabulous bakery (OK, yes, I’m obsessed …). 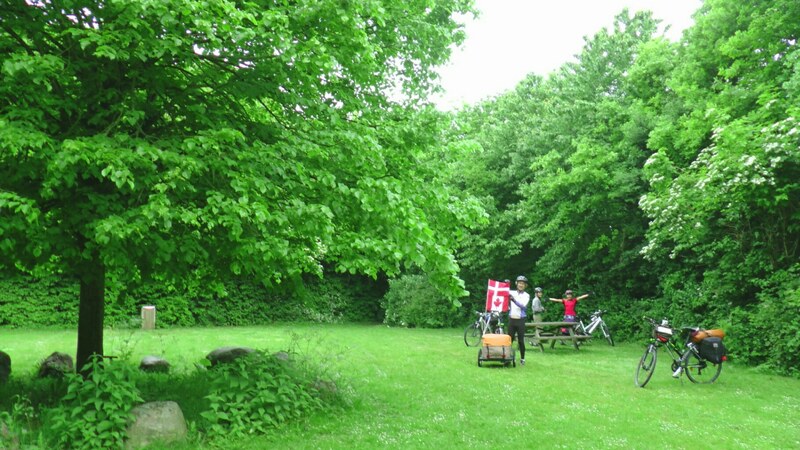 We cycled north past the western outskirts of Copenhagen and finally hit recognisable turf in the city of Hillerød. 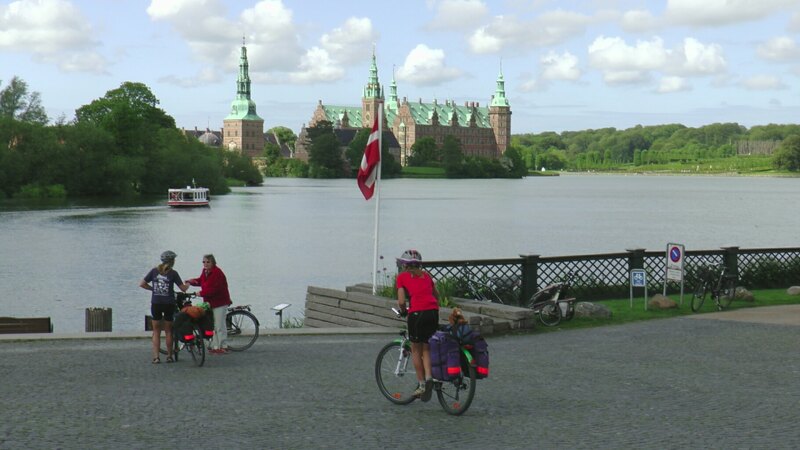 Aside from having all the great attributes of Danish towns (like walking streets, cycle shops and bakeries), Hillerød is known for Frederiksborg castle built on top of the ruins of a 1500s castle during the early 1600s by Danish King Christian IV. Frederiksborg Castle. We'd visited the castle on a previous trip so we cycled past. We were pretty excited at this point. 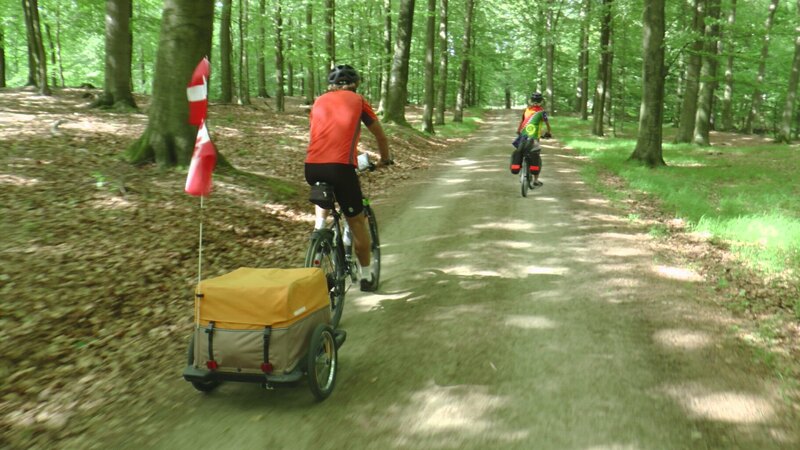 We had but 25km of cycling left to reach the farm, and we knew it was all through a large beautiful (Gribskov) forest. The well-marked gravel paths would take us right to the farm gate, and we knew the last few km very well. Bike route 33 - Hillerød to the beach at Gilleleje, right past the destination of "Gyldenlund" (Mariana and Borge's farm). I really loved these trails, but the very steep little hills were killers with the heavy trailer. I'd been taking pain killers on and off the whole cycle tour because I'd strained my knees trekking in Nepal. As it turns out, I would not have been able to put in another day riding - my knees were done. How's that for timing! Bittersweet feelings here for sure. 1700+km of magnificent riding coming to an end. But so looking forward to seeing Betty, Marianne and Børge at Gyldenlund. 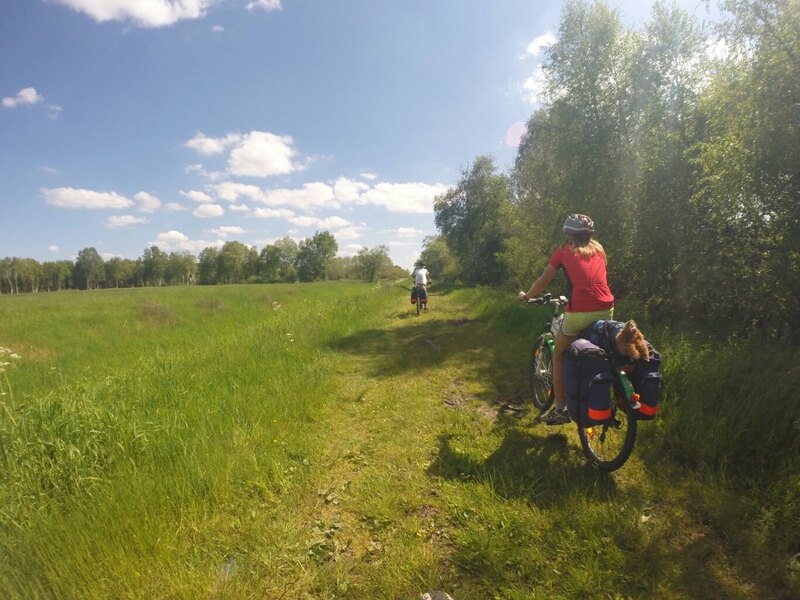 We found the tiny path that cuts off the cycle trail towards the farm and all started ringing our bells to announce our arrival. Børge and chocolate lab Bruno were the 1st out, then Betty and Marianne as we rode the last 100m through their field. Their farm feels like a 3rd home to us. from left: Betty, Marianne and Børge. Earlier in the year’s journey, I had wondered whether our cycle tour through a relatively familiar Europe could hold a candle to the exotic locales of Nepal, Indonesia and Vanuatu. Of course, they are very different, but the cycling was everything and more than I’d hoped for. We rode very well as a family and Kaia and Jake really found their legs. We had only 1 flat tire and 1 popped spoke over seven weeks on four bikes. We ate well. Yvonne and I drank well. The depth of history and the associated architecture astounded us. It was wonderful to reconnect with friends we’d met during other journeys. We were so independent, being able to easily get anywhere we wanted, and because we were willing to freedom camp, we spent no time worrying about or planning where we’d stay each night. We were outside 98% of the time, including sleeping in our tent all but a few nights. We were active, and became fit. But perhaps what stands out the most was the inspiration we all received by the remarkable initiatives the Germans, Dutch and Danes have put in place to help people get out of their cars and on to bicycles. It truly is a pleasure to cycle in this part of the world. We included this part of the world in our journey because we wanted to see and document their leadership in sustainable transportation and renewable energy. I did not get as far as I wanted to in documenting the energy story, in part because of the language gap for me in Germany. But we were (excuse the tired expression) blown away by the cycling and public transit infrastructure. After weeks of riding, when we thought we’d seen it all, we’d each day discover new innovations that made our heads race, thinking of possibilities back home. Yvonne will pick up on this thread in our next entry. As I write this a full 5 weeks after completing our journey, my knees still keep me off my bike. But I trust they will heal soon with more rest, and I’m rearing to hit the trails and roads around Peterborough and Haliburton. Cycling rocks!